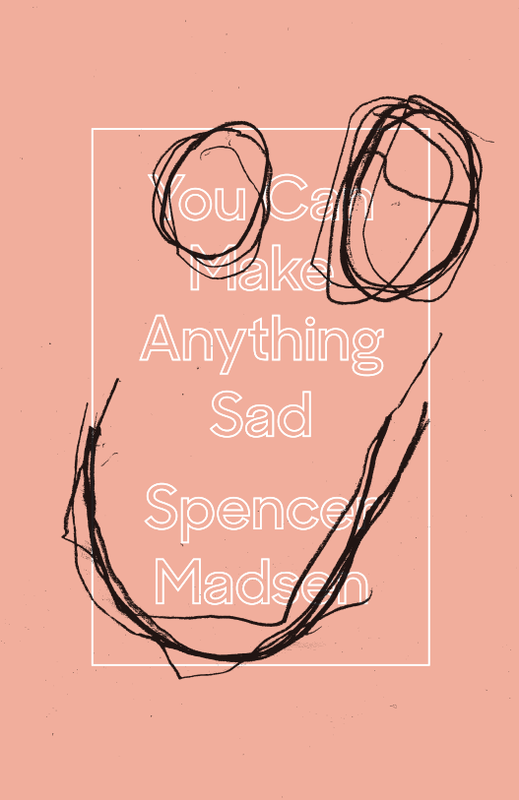 After reading Spencer Madsen’s new book “You Can Make Anything Sad,” I immediately wanted to bury it in the backyard so that my future-self could dig it up and reread it. I wanted to buy fifteen copies of the book and send it to fifteen of my closest friends. “Understanding that people are always a worse version of who they want to be is a way of loving them,” writes Madsen. “A new emotion I’m feeling is called Everyday.” “Just be patient and you’ll die eventually.” These sentences aren’t just lines in poems—they are mirrors to the dark humor we often say or think in equal parts jest, seriousness, depression, and awe of life. “You Can Make Anything Sad” knows that just because we often celebrate life communally, it doesn’t mean that we aren’t individually experiencing reality in a similarly disheartening way. Louis C.K. feeds off this same kind of individual/communal sadness in his TV series Louie—so well, in fact, that instead of feeling sad about all the sad mess of Louie or his situation, I watch an episode and mostly feel happy. “You Can Make Anything Sad” is no different in its makeup—it’s well-crafted misery that breaks existence down into small lines and observations and anecdotes, much of which wallows in all that’s depressing and pointless. But also like Louie, Madsen’s book illuminates what’s depressing and pointless for more than just commiseration. Lines full of hope shine through the bleakness (some so blunt as “I’m always trying to be a better person”), and after reading Madsen’s book I find myself in the same emotional space that I am after watching Louie. I am happy and appreciative for all that’s great and terrible. A form of therapy called It doesn’t get better. Bipartisan political party called We are all going to die. post office or walking a dog. An internship called Scared and needy. A brand of whisky called This won’t make you a better writer. A brand of cosmetics called Afraid of dying. A t-shirt that says I’m not this. Purchase You Can Make Anything Sad HERE. Reviewer bio: Michelle Dove is the author of Radio Cacophony, forthcoming from Big Lucks Books. Recent writing appears or will appear in Chicago Review, Pear Noir!, Alice Blue Review, and Sixth Finch. She lives in Washington, DC.